I love fresh juice, but my clunky juicing machine spends more time in my basement than in use. But I’ve recently heard about masticating juicers, and I’m interested to learn more about how these may be a better option for anyone who loves fresh juice. In this article, I’ll explain the mechanics and benefits of masticating juicers and take a look at some of the most popular options you can buy. If you’d like, skip ahead to the Amazon listings for those recommendations through the links in the table below to check current prices and ratings. Masticating juicers are also known as “slow” and “cold press” juicers. Have cold pressed juices become all the rage where you live, too? It feels like we get a new juice bar in our neighbourhood every month! What is special about this juicing process? A masticating juicer, as the name suggests, “chews” and crushes the fruits and vegetables to extract the juice. It’s a gentle process in which an auger (like a large drill bit) moves the produce through tunnel, munching it up along the way. The juices then squeeze out through a mesh filter while the pulp matter gets separated out. This stands in contrast to the other main type of juicer, a centrifugal juicer. These juicers shred and then spin the fruits and vegetables, whipping the juice out like the water in the washing machine’s spin cycle. They work quickly, and are generally pretty inexpensive. So why bother with a masticating juicer instead of the quicker, more affordable centrifugal juicer? While centrifugal juicers spin at 1,000+ rotations per minute, masticating juicers spin at more like 50-80 RPMs). In the case of juicing, “low speed” is a positive quality. You tend to get a bit more juice from this slower process. These factors have to do with oxidation, which occurs when fruits and vegetables are exposed to air. Unlike the whirring action of the centrifugal juicer, the slow and gentle process of a masticating juicer exposes the ingredients to less air, resulting in more nutritious, tastier juice that lasts longer. Look at the difference in the color of these two juices, one made in a masticating and one in a centrifugal juicer. Masticating juicers are better at handling leafy greens, so they’re preferable if you want nutrition-packed green juices. They can also make nut butters and sorbets. Yay for multi-use appliances! This is huge for me. One of the main reasons my juicer collects more dust than juice is that it’s a pain to clean: the shredding disks, the mesh filter, the cone it all sits in, the housing, and so on. Masticating juicers tend to have fewer parts for easier clean up. This appliance is an investment, so it’s important to consider features to look for when shopping for a masticating juicer. Most juice enthusiasts rely on the lower effort of an electric juicer, but manual masticating juicers do exist and are often less expensive. This is a good option if you either can’t make a large investment, don’t plan on juicing often, or want to try it out before committing to something more expensive. Many high-end masticating juicers have special attachments to let you do other tasks. Having these options will extend the usefulness of your machine. Vertical juicers feature a newer design, which utilizes gravity to accelerate the juicing process. They tend to be easier to clean, as you can simply run water through the machine after juicing. Another benefit is that they usually take up less space. Despite these advantages, horizontal juicers tend to offer more versatility, such as the ability to make nut butters. Horizontal masticating juicers usually produce less pulp compared with vertical juicers. Juicers work hard and have a lot of moving parts; even the best ones can break down. Therefore, it’s a big plus if the manufacturer offers a decent warranty and good customer service. Below are some of the top rated masticating juicers for you to consider. This manual juicer comes in a peppy green color scheme. It suctions to your work surface for stability as you grind your ingredients through with the hand crank. Like all manual juicers, this one is quiet. Another benefit is that it can be used while travelling. This juicer is mostly plastic, but some of the internal components are metal. This masticating juicer definitely takes more effort than an electric juicer, but reviewers have good things to say about this option. People find that it does a good job, even with leafy greens and difficult ingredients like wheatgrass, and it feels substantial despite being mostly plastic. Owners also note that this is easy to clean—the parts come apart easily and there are no motors or electric bits to avoid getting wet. The main complaints with this juicer are that the suction is finicky. It doesn’t work well on porous surfaces (such as wood), and some reviewers note that the suction system breaks down over time. Other people find it’s just too much effort—especially for tough root vegetables like beats and carrots. Some people also find it can clog up pretty quickly. Aicok is a fairly new company that makes a number of small appliances and kitchen tools. The customer service seems responsive, which is a plus. This machine has a 2 year warranty and comes with a cleaning brush. 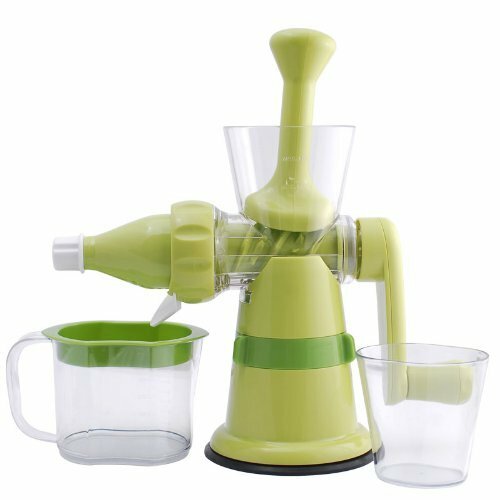 This is an electric horizontal masticating juicer with mostly plastic parts, which makes it an affordable option for this type of juicer. Its small footprint makes it a nice option for someone with a small space. A reverse function helps to handle potential clogs. Many people love this juicer and find it’s a great value. Lots of reviewers note how much more efficient it is at extracting juice than centrifugal juicers they’ve used, despite this one being comparable in price. Owners report that the plastic pieces are thick and sturdy, and the juicer can handle leafy greens well. Another plus with this machine is that it has few parts and is easy to clean. The complaint that most negative reviewers have is that the parts tend to bend and twist when the juicer is dealing with hard ingredients like carrots. Although most people report that the juicer still works, they worry about the longevity since it seems so stressed. The other issue is that many of the parts are small—ingredients get stuck in the small feeding tube, the pulp container fills up quickly, and the juice collection container is small, too. Also, the plastic parts will scratch and get cloudy over time. SKG is a relatively new Chinese manufacturer of household electronics. Despite only being around for about 10 years, the products are generally pretty well-reviewed. This vertical juicer is available in both stainless look and red. A wide mouth feeder cuts down on prep time, especially for leafy ingredients. This is a heavy-weight juicer and all of the materials are of a high quality, intended to reduce oxidation. I like the design with the handle to help offer stability as you juice your ingredients. This juicer can make sorbet and tofu. Another benefit is the generous refund and warranty policy: SKG offers a 1-month free trial, a 2-year warranty for parts and accessories and an extended 10-year warranty for the motor and main body of the unit. Many reviewers really like this juicer. People appreciate features such as the wide shoot and the stopper at the juice output spot, so you can close it while emptying the collection container. Many people comment on how quiet this machine is, too. The most commonly mentioned drawback to this juicer is that it puts out pulpier juice than some other options. Some people appreciate this; others don’t. Another complaint is that there are some hard-to-reach places when cleaning out this machine, making it a bit of a chore, though people do note the assembly process is pretty easy. Read pretty much any discussion of juicing, and you’ll see the name Omega. It’s one of the best known and most often recommended juicers. This model replaces the older J8004/6 generation models with BPA-free plastic parts and a metal rather than plastic screen. This juicer comes with an extra mesh filter and 6 different nozzle attachments for making other things like pasta, bread sticks, and baby food. It can also be used as a spice or coffee grinder. Another big benefit is that Omega offers a full 15-year warranty, and is an established company with good customer service. Many reviewers have great things to say about this juicer. They report that it is easy to assemble, easy to clean, and does a great job of juicing, especially for things like leafy greens, wheatgrass, and hard root vegetables. The main complaints are that it struggles with soft items like citrus and even softer apples. These tend to come out very pulpy or get backed up (some people recommend putting something hard through like a carrot to full push out the softer items). Others also complain that the feeding tube is small, so you need to cut the ingredients small. Hurom is another frequently mentioned name in juicers. 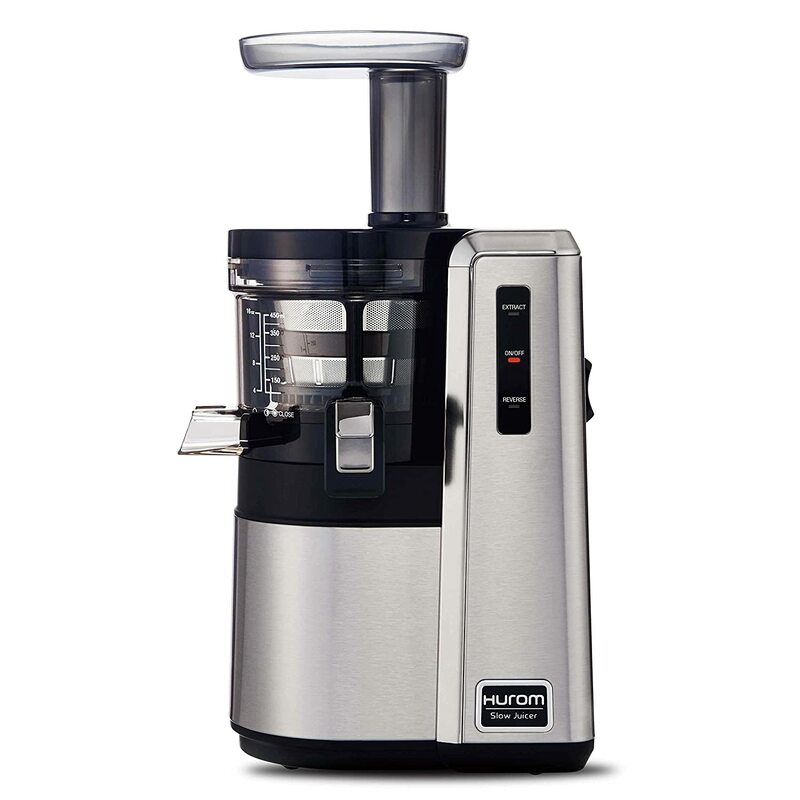 This model is a vertical juicer in a sleek stainless steel finish. 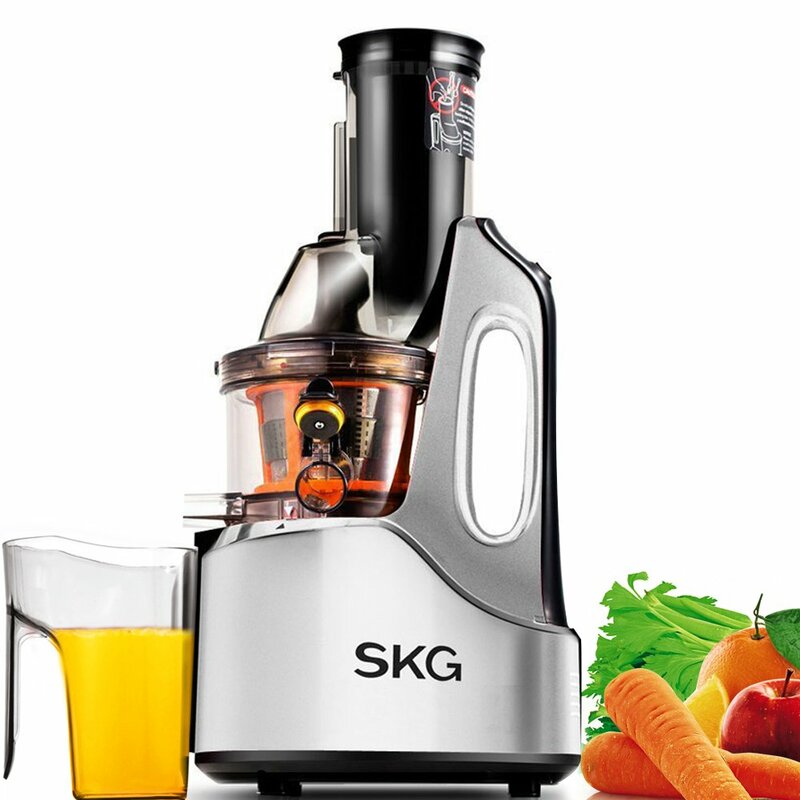 Its rotation is even slower than most masticating juicers, though the vertical orientation helps the speed. Of all the juicers I’ve reviewed, this one is the most attractive in my opinion. The actual stainless body, rather than chrome-coated plastic, is really nice. Small touches such as the measurement lines on the container, the stopper at the end of the output, the feeder tray at the top of the hopper, and a rotating brush on the inside to assist with cleaning, also add value to this machine. It has a pulp control lever and two different filters, plus it can make nut milks and ice cream. Given that this juicer is a fairly new one, there aren’t a huge number of reviews on it, but Hurom juicers have been reviewed on forums. Most people find that it has a very high yield and really gets the most juice out of the produce they put into it. Owners also note that it is very quiet. The primary complaint I’ve seen for this one and earlier models is that the pulp output can clog up pretty easily, especially with stringy things like celery. The juice is also fairly thick and pulpy, even with the ability to control it. After considering all of these juicers, I’m inspired to juice more, and maybe invest in a better quality machine. I might want to wait to see more reviews before buying, but my top choice would be the Hurom. It’s just such an attractive machine and looks to be of a very high quality. I personally like the idea of pulpier, more fibrous juice, and the small footprint is a plus for me, too. 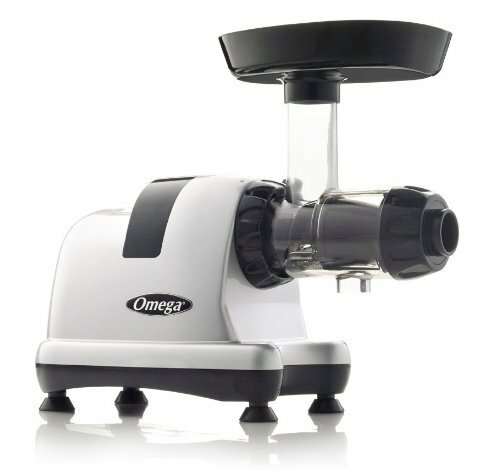 The Omega juicer is also a high-quality option that offers a ton of versatility beyond just making juice. 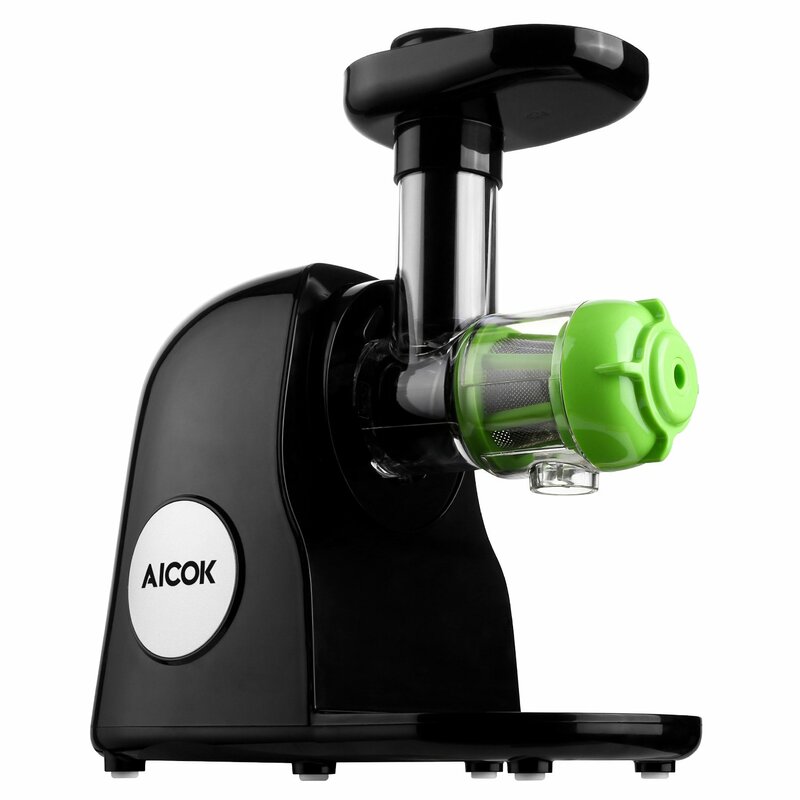 If you’re looking for something with a smaller price tag, the Aicok juicer seems to be a decent choice, though I would worry about the longevity of this machine. Whatever juicer you choose, read up on some juicing tips, as many of the complaints about clogging or difficulty with certain ingredients may be addressed by making some adjustments in your juicing process. Are you a regular juicer? What’s your favourite juice recipe? Share in the comments! Cooking (or ordering) Lots of Asian Food? Get Some Chopsticks! These Are The Reasons We Love Hummus!